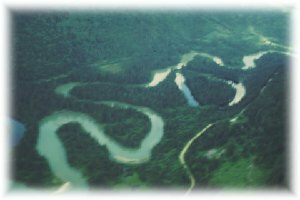 A wide, meandering river system containing floodplain wetlands, numerous oxbow lakes, sandbars, back channels, levees, along the glacier-fed North Thompson River. Note that no camping or day-use facilities are provided here. This park protects a wide meandering river system with a high level of diversity. This section of river is a very productive part of the North Thompson River. 280 km north of Kamloops on Hwy #5; the Park is accessed via logging roads at 6 km and 12 km west of Hwy #5 where the highway crosses the North Thompson River. The closest communities are McBride, Blue River, Clearwater, Vavenby and Kamloops. History – Established April 30, 1996 as a result of recommendations made in the Kamloops Land and Resources Management Plan. Conservation – Floodplain wetlands, numerous oxbow lakes, back channels and natural levees are encompassed within the park. Creeks on steep forested slopes on north and south sides provide fresh material in spring run-off. Wildlife – Suspected chinook and coho spawning, with high potential for rearing. Important habitat for Rocky Mountain whitefish, rainbow, and one of few stable bull trout populations in the region. Excellent moose habitat; noted for grizzly bear, wolves, beaver. A canoe or kayak is necessary to access the North Thompson River in this area. Always exercise caution when navigating the North Thompson River. Sweepers and log jams may not always be visible in advance. Anyone hunting in British Columbia must have an appropriate licence Check the B.C. Hunting Regulations for seasons and closures. This park has opportunities for wildlife viewing and nature study.